On Sunday, 9 March 2014, Sally Wallace from Canowindra will join 1,000 women of all ages and abilities to ride their bicycles from Sydney Olympic Park to Cronulla Beach in the Gear Up Girl Ride, Bicycle NSW’s celebration of women and bike riding. Sally will be joined by other Central West residents, Jess Ware, Jane Atkinson and Marissa Callaghan. The team call themselves the Four Fit Ladies and their past achievement of riding from Vietnam to Cambodia is a testament to this. The 2013 ride raised funds and awareness for Arthritis NSW, with a larger group including 2 other riders from Coonamble which is where Marissa hails from. 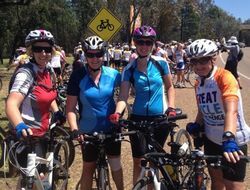 Now the Four Fit Ladies are taking on the 60km course to raise funds for TAD Disability Services’ (TAD) Freedom Wheels bikes for children with disabilities. TAD’s Freedom Wheels Bikes enable children with disabilities to ride a bike when it was never thought possible. Many of these children cannot walk but they can ride with help from the special custom modifications on the bike. These special bikes are designed to suit the individual child’s age, height, weight and physical and cognitive abilities. Thank you to Sally and the other Heroes riding in Gear Up Girl! Enter the Gear Up Girl ride here.